LIGHT has investigated the use of novel low-density lattice structures to support overhanging geometries and prevent deformation during printing. Members of the LIGHT additive manufacturing (AM) project consortium in the UK plan to share their findings of the two-year project at an event in April. The group’s research on the design of parts for metal AM will be presented a dissemination event in Bristol, UK, on 26 April 2016. Go here to reserve a place at the event. The LIGHT project, which is supported by Innovate UK, aims to implement and validate CADCAM solutions for lightweight components being 3D printed from metals in order to inspire new design freedoms and find new solutions for the AM of lightweight metal parts. In particular, LIGHT has investigated the use of novel low-density lattice structures to support overhanging geometries and so prevent deformation during printing. The design freedom offered by AM coupled with the promise of tool-less manufacturing, is compelling. 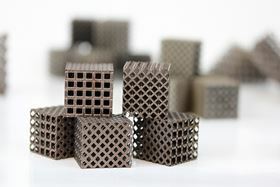 However, additively manufacturing complex parts with overhanging geometries requires the use of sacrificial support structures to hold the part during the build, the group notes. While necessary, these structures add constraints to the geometries that can be achieved using AM techniques. Through the LIGHT project, the consortium has sought to implement and validate CADCAM solutions that facilitate the selective replacement of internal geometries with self-supporting, low-density lattice structures. If these lattice structures can efficiently support internal and external overhanging geometries, new design freedoms can be achieved. During the dissemination event, the project partners will present case studies about the demonstrator parts created during the project. These include a crushable earth re-entry capsule designed to protect planetary samples during atmospheric entry, descent and landing, designed by Magna Parva, a jet engine thrust nozzle with operating conditions of 500°C designed by HiETA and an air brake door hinge that must withstand 50kN of force, designed by Bloodhound. The LIGHT project consortium includes Bloodhound SSC, Delcam, HiETA, CRDM/3DSystems, EOS, Simpleware and Magna Parva. This story uses material from Delcam, with editorial changes made by Materials Today. The views expressed in this article do not necessarily represent those of Elsevier.